It is cold and flu season in Canada and my daughter was already hit with a virus that made her feel very cold. Her feet were like ice so it was the hot water bottle and quilts to the rescue. Our hot water bottle did not have a nice cover like these though. Without further ado I bring you a tutorial for a quilted hot water bottle cover! Note: This post contains some affiliate links. See my "About" page for more on affiliate links. If you wish to have quilt blocks in your hot water bottle cover I used 8 1/2" unfinished (8 inches finished) blocks. Mine are from Sherri Falls' book "Winter Wonderland." One block for the front and one for the back. 1. Put a freshly sharpened pencil in your compass and set it to 1 1/2 inches. 2. Place freezer paper dull side up and lay the hot water bottle on top. Scribe around the hot water bottle with the compass. Be careful not to poke the hot water bottle with the sharp end of the compass. 3. Cut the hot water bottle template out of the freezer paper with paper scissors. If your tracing is a bit uneven pick the half you like the best, fold the freezer paper in half and cut around that half to get a perfectly symmetrical template. I don't know if all hot water bottles come in a standard size but I doubt it so we need to measure. Lay your block on your template and measure how much fabric you need to make a rectangle the size of the template. Lay one of your lining pieces on the batting and cut that as well. I do not recommend ironing the freezer paper to the batting because all the fuzz will stick to it and it will no longer stick to fabrics. 7. Once all the pieces are cut out create quilt sandwiches: layer front, batting and lining together and secure with pins or Wonder Clips. Repeat with back, batting and lining. 8. Quilt both quilt sandwiches. I used a walking foot and eyeballed a quarter inch from the edge of my foot for each pass to create diagonal lines that were (fairly) evenly spaced. 9. Lay front and back wrong sides (lining sides) together, use pins or Wonder Clips to hold in place and stitch around the edges with an 1/8" seam. I recommend using a walking foot to keep the layers from shifting too much. I always link my tutorials and blog posts in my newsletter so if you are enjoying this tutorial please sign up to be notified of new posts. You need bias binding to bind this project because there are curves. The bias binding will stretch around the curves. There are some videos on YouTube that show you how to cut a larger piece of fabric with some fancy folding but today we are using a fat quarter. If you want to know how to cut a larger piece such as a yard then I recommend searching YouTube for Bias Binding Tutorials. 10a. Trim the selvage edge off the fat quarter and lay it on the mat with the freshly trimmed edge at the bottom. Line the 45 degree line of the ruler up with the freshly cut edge. Make a cut across the diagonal (the bias) of the fabric. Measure off that diagonal cut 2 1/2 inches to cut binding strips all across the fabric. Sorry this is a bit blurry. I was trying not to use my flash. 10b. Sew the binding end to end and press seams open. Now, this part can be tricky. I still get confused so here's how I do this step to avoid confusing myself and sewing things incorrectly. Lay the fabric end to end as it would be when sewn together. Flip the fabric on the right over onto the fabric on the left with right sides together. Here I have pulled the top fabric back a bit so you can see that there are 1/4 inch triangle shaped extensions on either side. You need this 1/4" seam allowance extension in order for the strips to line up when pressed open. This is how you will place your fabric to put it through the machine. Edges are lined up with 1/4" extending from the top piece and the bottom piece. (It's just by chance that my stripes are lining up perfectly here... that doesn't usually happen so don't worry about that if you are using striped binding.) Sew with a 1/4" seam and press open. Repeat until all strips are sewn into one long binding strip. 10c. After pressing all joining seams open fold the whole long strip in half wrong sides together and press the length of the strip. 11. Sew the bias binding on one side of the water bottle cover with a 1/4" seam. Fold the binding to the other side and hand sew the binding down. I secured my binding with Wonder Clips which sped up the hand binding process for me. 12. After sewing the binding down, trim off the excess from the top of the hot water bottle cover and machine sew binding to the outside of the neck opening. This is tricky. You will need to go slowly and continually check to make sure you aren't catching the other side of the neck opening in the seam. Fold the binding to the inside and secure with clips. Hand sew the binding to the inside. 13. Fold the hot water bottle into thirds and carefully insert it into the hot water bottle cover. This can be finicky so take your time. 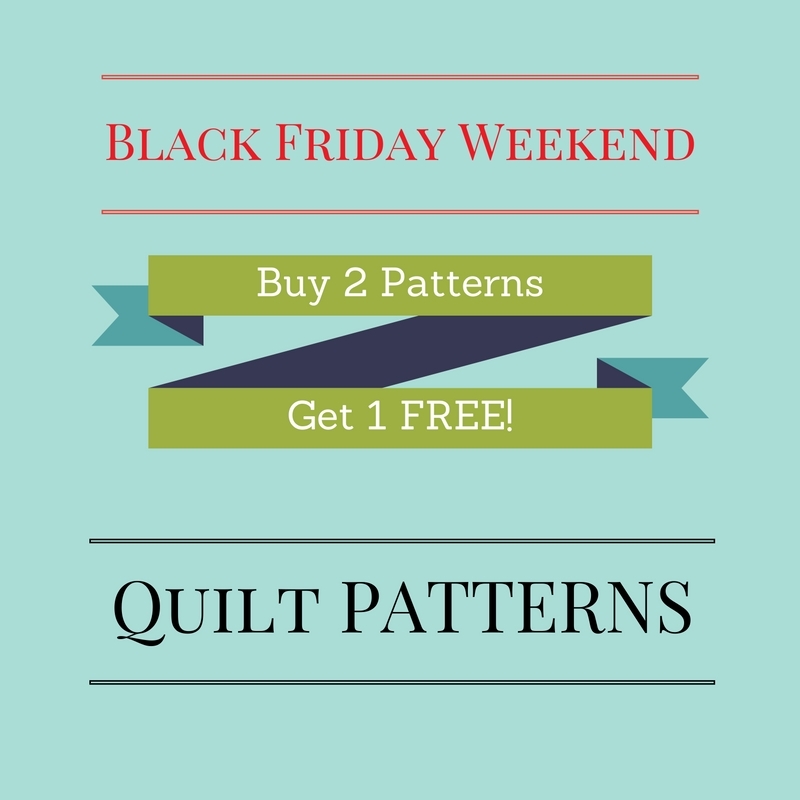 Don't forget to sign up for Daydreams of Quilts Newsletter for updates, free printables and free PDF tutorials. 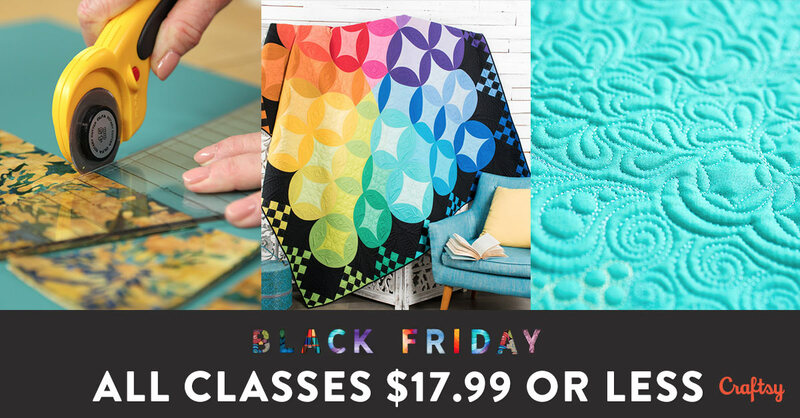 Daydreams of Quilts is having a Black Friday Sale thru to Nov. 28th, 2016. Use coupon code BF2016 at checkout for 20% off all physical products in the shop. 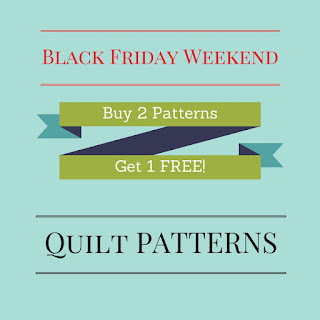 All patterns are Buy 2, Get 1 FREE. Look for the listings like the image below in the shop sections. And don't miss Craftsy's biggest sale of the year all Weelend thru Monday! Click here to SHOP CRAFTSY.